Being only 5' 2" tall I have a need to lower the GL1000 so my feet will touch the ground. I have been riding since 1963 but have never had a Goldwing because of the height problem. My plan is to enter the progress of the build day by day as I get it done. The bike I am using is one of seven I have purchased over the summer. 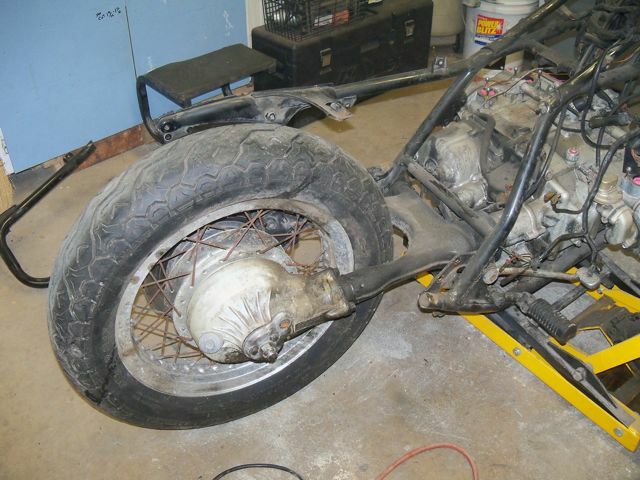 I first have stripped most of the seven which helped to gain knowledge of the Goldwing construction. 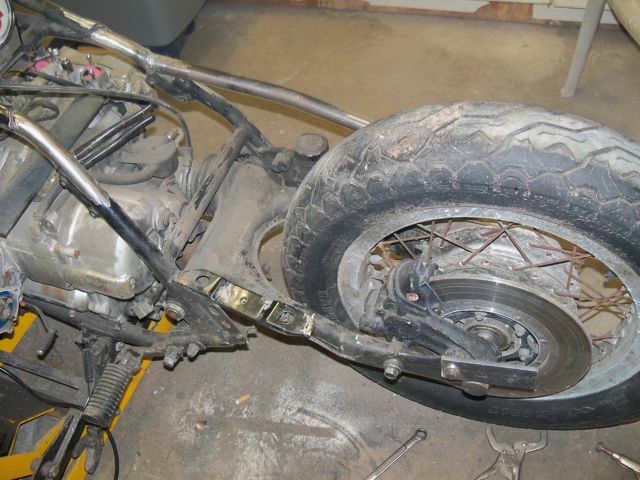 The bike I am lowering is a 1975 which was near a fire and is in bad need of a complete clean-up. This is the frame cutaway on the right side. I notched the frame at the bottom in order to push the new tubing inside and have more area to weld the two lower pieces together. After sitting and looking at it for a while I decided how I was going to go about changing the rear. I bent new bars for the right side and made two 2" X 5" plates to bolt to where the old shocks used to be. After numerous fittings I finally tack welded the right rear together. After everything is tacked I will remove the engine and strip the frame bare, then weld and plate up the areas that I can't get to now. I might add that the old gas tank will not be used, a tank will be added top side and the electrics that were under the top covers will go down to the lower area. I also must state here that I am not a welder, some of the welds may appear to be bubblegum, Once I get the whole project tacked and stripped I will go back and grind, &amp; plate the bad welds. I do much better when I can get at the welding on a flat level surface and not laying on the ground. You may also notice as I go on I tend to overkill the project, I have never had anything I have welded come apart after I am finished with it. 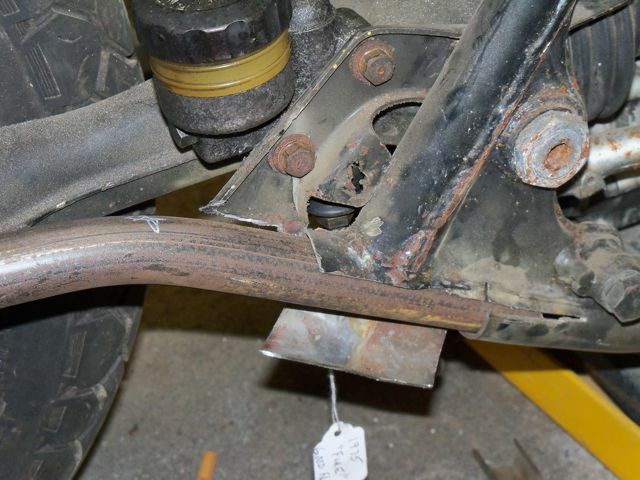 This is the right rear tacked together, with a gusset I was fitting. The top bar is welded on both sides the bottom is only welded on the top. 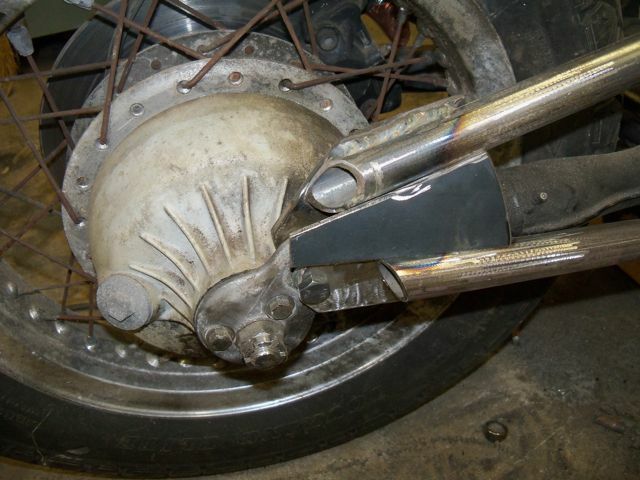 One nice thing about a Goldwing is that with it being drive shaft driven, the shocks and frame around the rear can be removed and the rear wheel will still be straight with the frame. This is the reason I also left the engine in the frame, it helps to keep everything in alignment. The rear differential will still be able to be removed after the changes, actually I believe (hope) some things will be easier to get at. I have now removed the left side of the rear frame. I mentioned the good thing about the Goldwing being drive shaft driven, I forgot the bad, because one side has the drive shaft and one just has the shock, the sides are different. 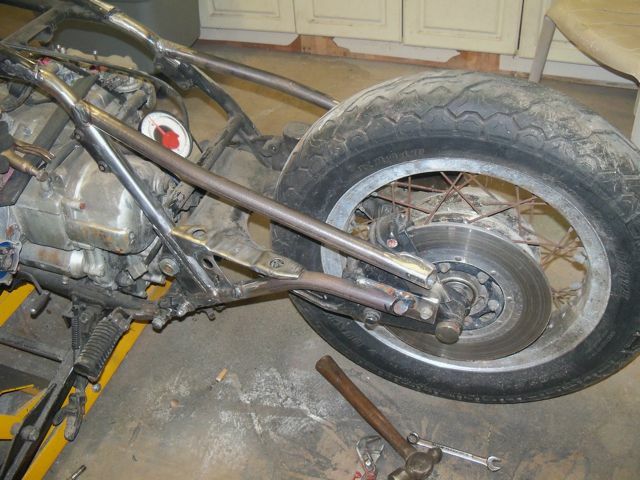 This means the two sides will not look exactly alike when bending the frame tubing. Oh well you can only see one side at a time anyway. 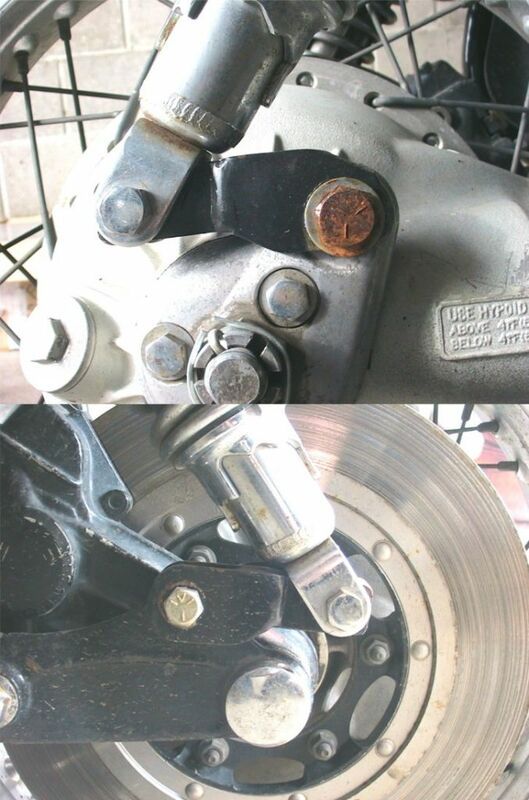 In the last photo you will see because of the bolt that mounts the caliper I had to change the plate that bolts where the shock usually goes to a little different angle. When I finish putting the gussets in I will try to make them look as similar as I can. I forgot to add before that I notched out the top bars to make them fit the frame as close as possible. The angle of the tubing is the same on both sides it is just the mounts at the shock bolts that are a little different. From what I see in the pics, those welds ain't bad by any stretch. You wanna see "bubble gum", you should see my first welding attempt with a harbor freight 90 amp mig, it was horrible. Mind you, I've gotten a lot better over the last 8 years. Looks good so far, keep it up. I have added the photos so far to my "zimco" photo gallery, I guess I can only put 1 here per post. You can add as many as you like to each post by clicking the "G" button in the editor and browsing to your gallery pictures. And keep us updated please zimco, this will be an interesting thread to follow. Interesting, ...but: what about the fuel tank? Nice work on what you've done. Fuel tank will be mounted in the usual top motorcycle style. I will rewire and move basic electrics to other locations. Standard lowering doesn't do it, at 5' 2" my feet would still not touch, even at this rate I may not get down to flat footed. All I have is time and besides this type of thing is fun for me, and it keeps me out of trouble. My wife is also retired!